When I Said I Wanted To Feel Like A Kid Again, I Didn't Mean I Wanted Acne! Hey all, i signed up on the org in the later part of this summer and i have to say the Community feel is amazing. Hearing the successes of others as well as the frustrations really make living with acne on a day by day basis much easier. I have finally gained the courage to post pictures of my acne and acknowledge that i am an adult with acne and it embarrasses the crap out of me and significantly affects my self esteem (i have loads of blackheads on my forehead and many disgusting whiteheads and inflamed pimples on my chin and both sides of my mouth - they appear and disappear in the same spots). I am a teacher in NYC and i'm just waiting for the day my kids point it out - i know i'll just want to melt into the floor. I went to a skin specialist (not a derm) and she recommended to just use a basic gentle cleanser and moisturizer and exfoliate with Trilogy exfoliater once per week just to get my skin PH back to normal. I go back to her Friday to see what's up and to air my laundry list of complaints. I took a blood test this weekend with hopes/trepidition of going back on Accutane for a third course so on Thursday my doc will let me know if it is a yay or a nay. How do i post multiple pictures? I am also an adult female (28 years old) dealing with acne. Still! Personally, I think you're doing your skin a favor by cleansing and moisturizing twice per day. For my acne, it seems like the more products I pile on, the worse it gets. 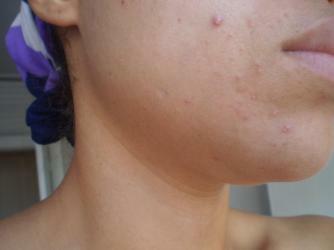 From what I can see in the pic you posted, your acne isn't all that bad. It looks a lot like mine - concentrated around my mouth, chin, and jawline. I know what you mean about waiting until someone mentions your acne though, it's a huge fear of mine and I can totally relate to wanting to melt into the floor! Just keep your chin up, don't worry about what the kids (or anyone else thinks), and continue living a healthy lifestyle. Don't be afraid to eat though - it might seem like every tiny particle that touches your face is going to make you break out, but not giving your body the nutrients it needs isn't going to help, either. Hang in there! Thanks for the kind words! Since this post, i went on Claravis (generic accutane) for about a month but had to stop because of health concerns (bummer). I am now on 4 different topicals so i'm hoping something works for me. I try to live my life without the fear but its a struggle. How are you dealing with things on your end? I am going to see a nutritionist tomorrow to discuss my eating issues so that i can have a balanced meal plan. Ahhhh, you talking about your kids reminded me of this time I was babysitting and the 5 year old girl asked what was on my face. I wanted to die. yeah, kids can be unintentionally hurtful with their comments. i used to teach 6-7 year olds, and one of them asked me "why do you have spots all over your face?" and then proceeded to point out where i had all of them. i had to run from the classroom to cry. to the OP, I hope that your regimen begins to show improvement in your skin - i used finacea + really loved it but had to stop due to dry/flaky skin issues. hopefully seeing a nutritionist should assist in helping you cure your acne from the inside out. Thank you all for your input! This has been a rough road, especially with my other health issues. I too hope for success with my new regimen but i'm trying not to get too excited (too much disappointment in the past). I am now on Aczone and Finacea in the day and Ziana at night. Feel free to check out my log and see the current condition of my face as of today - i can use all the support i can get. Kids are sometimes too honest but they mean no harm. And believe me ohsailor, i have cried many a times...we all go through that. I should invest stock in Kleenex. What is everyone's regimen like? Is it working?